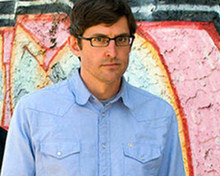 For Monday's event at London's Frontline Club, Louis Theroux - documentary maker, broadcaster and son of travel writer Paul - chose not to show one of his latest offerings, the BBC Two Law&Disorder films, but instead opted for one of his favourites: 'America's Most Hated Family'. That's because he can't remember all the statistics for his recent films based in Philadelphia and Johannesburg and would like to avoid tough questions from the journalists present, he later jokes with the audience. It seems a shame because the Law&Disorder pair of films tackle arguably meatier subjects and have been a talking point for both the public and television critics in terms of his journalistic direction. Talking to Theroux before the film showing, in a tight 15 minute slot, I ask if he is now a journalist proper - or has he always been? "I've always seen myself as a journalist to be honest with you," he says. "I think some people got the idea [that he wasn't] because they came to me via the personality profiles I did, like Jimmy Savile and the Hamiltons." While he started out working for Michael Moore on subjects such as the Klu Klux Klan, he says he has 'evolved' a bit since the Weird Weekends: "I used to discard stories because they didn't seem too funny - I don't do that any more." So, what is the impetus to make a film? "At the heart of it there needs to be a kind of a big 'why' question; why such and such a person is engaged in such and such a behaviour," he explains. "It's all about motivation," he adds. He was intrigued by Ann Widdecombe, for example: "She took us inside Tory politics. She was an extraordinary looking person at that time - she had made certain sartorial and grooming decisions that... were up for debate," he hesitates. An 'interesting triangular relationship' is how Theroux describes his time with Widdecombe and her mother. "There was Ann who was being this political figure who always had her mask on, and then there was her mother - quite flirty and cuddly and sweet-natured," he describes. Theroux nearly blew the deal when his third question was about whether or not Ann Widdecombe had ever had any 'romantic liaisons', he recounts. It is this type of question which forms part of Theroux's characteristic style, and critics often comment on his, perhaps deliberate, 'naive' interviewing style and on-screen persona. Disconcertingly, in our interview he throws all questions back at me, more than one at a time: "Why do they say that? Is it the idea that you shouldn't ask those straightforward questions? Can you give an example of what someone might call a bovine question?" Well, I answer (I'm not going to quibble over interview etiquette as I've got nine minutes left), perhaps there are times when you ask a question it seems you already know the answer to? "It's certainly true I do ask questions where I do know the answer and that's the nature of television. It's not [a put-on persona]. I just try and ask the most obvious questions and by asking them, and by keep on asking them, you sometimes get somewhere," he says. Another thing journalists have homed in on is his protection of his own privacy. Is this a fair comment? Is he more private about his life than most people in the public eye? "Who obsesses on it?" he asks back. Well, it was picked up by the interviewers Simon Hattenstone and Rachel Cooke, for example, I answer. "I don't think I'm that different from most people," he says. "Because I'm on television [people think] I'm somehow in showbusiness, but really (...) I never feel I've completely signed up to that contract. "On camera I'm a journalist too - it's not just a question of personal privacy, though that is part of it. In order to do the investigative stories I do, it's important to keep something back - I can be a somewhat neutral person, without baggage," Theroux adds. And - I've got time for one final question before time is up - how does he feel about intervention in his subjects' lives? "It's not a case of anything goes. You are a moral being and that's how you've got to operate. You don't cease to be a human being just because you're making a programme," he says. And to satisfy our Twitter followers, a crowd-sourced question: does he use, or intend to use Twitter? "Are you suggesting that I do?" he asks. "I have enough trouble keeping up with my emails, let alone updating my Facebook account [but] I would say I'm not against it. "I've got two children, I don't know I've got time. I've found YouTube quite useful [he later admits in the audience Q&A that he once drunkenly re-watched 'America's Most Hated Family' on the video site while on location], Facebook quite useful. Skype - I've been doing a bit of Skyping when I go away. "Do they call it web 2.0?" he adds. "I can't keep up - I'm not even going to try..."